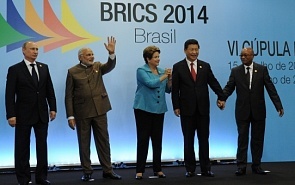 The 14th Valdai paper “The G7 and the BRICS in the post-Crimea world order” is devoted to two international structures - BRICS and G7, its’ role and policy towards Russia’s actions during political events in 2014 as well as on the eve of summits which will take place in summer 2015, as the author presumes, in the context of a growing estrangement between Russia and the West. The author assesses the situation through giving the answers, what is the position of the BRICS countries on current political issues, if the BRICS countries are willing to protect Russia and provide support, if confrontation between BRICS and G7 is possible, where the internal differences in both structures can lead to. The paper’s author is Oliver Stuenkel, an Assistant Professor of International Relations at the Getúlio Vargas Foundation (FGV) in São Paulo, where he coordinates the São Paulo branch of the School of History and Social Science (CPDOC) and the executive program in International Relations. He is also a non-resident Fellow at the Global Public Policy Institute (GPPi) in Berlin and a member of the Carnegie Rising Democracies Network. His research focuses on rising powers; specifically on Brazil’s, India’s and China's foreign policy and on their impact on global governance.